Gopinath Bardoloi, better known as ‘Lokapriya’, was born on June 6, 1890 at Roha in the Nowgong district of Central Assam. He was the second son of Dr. Bhudiswar Bardoloi and Praneswari Devi. Bhudhiswar Bardoloi was in the Government medical service in a junior cadre. Praneswari died when Gopinath was just 12 years old. After the death of his mother, his eldest sister Shashikala Devi brought up Gopinath. After completing his post-graduation, Bardoloi joined the Guwahati High School as Head Master, but soon left in 1917, after obtaining his Law degree, to join the Bar. Early in life, Bardoloi was influenced by Manickchandra Barya and swami Sureshananda of Panchabati Ashram, Guwahati. Later in his life he was also deeply influenced by Tarunram Phukan and Nabinchandra Bardoloi, two of the stalwarts in Assam at the time. In response to the Gandhiji’s call for non-co-operation, Bardoloi gave up his legal practice and plunged himself into the freedom movement and was imprisoned for his participation in early 1922. He became the leader of the freedom struggle in Assam and was imprisoned again in 1940 and in 1942. As the Congress Party Leader in the Provincial Assembly in 1937, he brought the struggle also into the legislature. Bardoloi resigned his Premiership in 1939 in protest against the imperialist war. He joined the Individual Satyagraha movement in 1941 and courted arrest. He voiced his views regarding India’s unity, state autonomy, economic justice to Assam and other issues in the seminar discussions held at the Jorhat jail in 1940-41. He used his office both before and after independence, to lay the foundation for a progressive Assam and to set the trends for Assam’s future reconstruction in every sphere. Gopinath Bardoloi was very interested in improving higher education and was largely responsible for the establishment of the Guwahati University in 1948. He was also instrumental in establishing the Assam Agricultural Collage, the Assam Medical College, the Assam Veterinary College and other technical institutions in the State. ‘Lokapriya Bardoloi’ was indeed dedicated to the people’s cause in Assam. He was very concerned about the welfare of the people, especially of the weaker section and the tribals. His forceful plea as a head of the Constitutional Sub-Committee to examine the question of tribal autonomy, for Sixth schedule, shows his profound concern for the tribals. He was also interested in various other fields, ranging from sports to music and from theatre to literature. While in jail, he wrote several brilliant books including biographies of Saints and Seers with stress on the basic essence of humanism in their teachings. 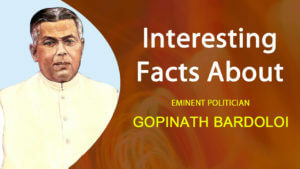 Gopinath Bardoloi is often called Assam’s savior, particularly because of his extremely courageous role in resisting the infamous Coupland plan for a British colony in the North Eastern Hills, the Cabinet plan for Assam’s grouping with Bengal and Muslim league’s threats to have the province in Pakistan. Impressed by his courage, Sardar Vallabhbhai Patel, the ‘iron-man’ of India hailed Bardoloi as ‘Sher-e-Assam’ or the Lion of Assam. Gopinath Bardoloi was a tall, handsome man. He had simple tastes and always wore khadi. He was deeply religious. He was also a good siger and sang devotional songs. On Janurary 30, 1999, Gopinath Bardoloi was honoured with the country’s highest and most prestigious award, the ‘Bharat Ratna’, albeit a little too late.